Diamonds with this trait may fetch lower prices on the market, but some in the trade are embracing the opportunities they offer. RAPAPORT... With an inconvenient leading letter, fluorescence falls outside of the 4Cs. Yet that hasn’t stopped it from becoming an essential element when it comes to haggling the price of diamonds. In the grading world, fluorescence refers to “the visible light some diamonds emit when they are exposed to ultraviolet rays,” according to the Gemological Institute of America (GIA). Most of the time, the light is blue, though occasionally it can be white or yellow (see box). “The first thing you do when you tip out a parcel of diamonds is put it under the fluo lamp to see how highly fluo it is,” admits Satta Matturi, founder of rough-diamond-buying service Ideal Luminescence. While GIA studies show that this trait has no noticeable effect on a diamond’s appearance in the vast majority of cases, “diamantaires have generally looked down upon fluorescence” as reducing the stone’s value, notes Eddie LeVian, chief executive of American jeweler Le Vian. Indeed, most industry buyers latch on to this diamond feature as a gateway to lower prices. The Rapaport Price List has a section dedicated to the discounts one can expect for diamonds with blue fluorescence. Depending on the stone’s color and clarity, the discount can be as high as 25% if the fluorescence is very strong, or as low as 1% if it’s faint (though lower colors may have no discount at all). One of the most serious — and popular — criticisms is that fluorescence can cause diamonds to look milky. Yet the GIA reports that fewer than 0.2% of the fluorescent diamonds it’s received for testing have appeared “hazy or oily” as a result of the fluorescence, so that phenomenon is incredibly rare. Though fluorescence is still an influential factor in the pricing matrix, attitudes toward these diamonds are softening as the market tries to shift away from a rigid 4Cs approach to selling — and also as tightening budgets lead trade and consumer buyers to tinker with their ideal specifications. British jewelry designer Cora Sheibani feels similarly. Her Glow collection not only accepts fluorescence, but celebrates it: Clients are encouraged to view the highly fluorescent gems she has picked out for her jewels — such as the aptly named Disco ring — under UV light and marvel as the colors change. 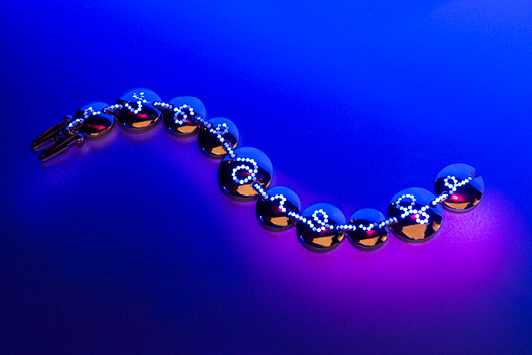 In addition to diamonds, Sheibani has used colored gemstones that fluoresce, such as spinels, rubies and tourmalines. These glow-in-the-dark jewels will be coming to New York in May, with a deliberately darkened exhibition space showing them off in all their luminous glory. While Eghiazarian and Sheibani love the color play, some buyers believe fluorescence can enhance the brilliance of white diamonds in the right color grades. Research by Venus Jewel, which specializes in manufacturing solitaires, has shown that in the top three colors — D, E and F — fluorescence enhances the stone’s luminance for a stronger sparkle. Others in the trade report similar findings, with the GIA saying that “in many instances, observers prefer the appearance of diamonds that have medium to strong fluorescence.” Emms disagrees with those observers, but does feel that yellowish diamonds tend to look better when blue fluorescence is present. As with the 4Cs, the beauty of this much-debated “F” is in the eye of the beholder. “The overall objective needs to be achieved [through] looking at a stone and making sure it’s sparkly,” says Hanzi. “I don’t see people walking around with microscopes.” Or, indeed, UV lamps. Up to 35% of diamonds display some level of fluorescence. In more than 95% of cases, the emitted light is blue, though there are instances of other colors, such as white or yellow. The GIA bases its fluorescence grades on the strength of the light the stone emits when exposed to long-wave ultraviolet rays: “none,” “faint,” “medium,” “strong” or “very strong.” If the fluorescence is medium or stronger, the grading certificate will also note the color of the fluorescence. Studies show that fluorescence has no impact on a diamond’s structural integrity, and in the majority of cases, no noticeable effect on its appearance. This article was first published in the April 2019 issue of Rapaport Magazine.